I've spent about a week away after the passing of my dear grandmother Bubby Green and although I can't help being sad when I think of how much I miss her I know that it is important to try and find comfort and continue on with my daily routines to keep my thoughts busy. I just want to thank all of you again for leaving me such lovely comments with your words of condolence and for your patience while I took a break. I really do appreciate that so much. The end of April is nearing which means it's time for me to feature a kitchen of the month. And for this month I have chosen this one with white and green accents. The color green makes me think of all things related to the Spring season like flowers, trees, buds and dew. It's also been named the color of the year for 2013 which I think is fantastic since I have always really loved all shades of green- chartreuse, mint, torquoise, teal you name it I love it! 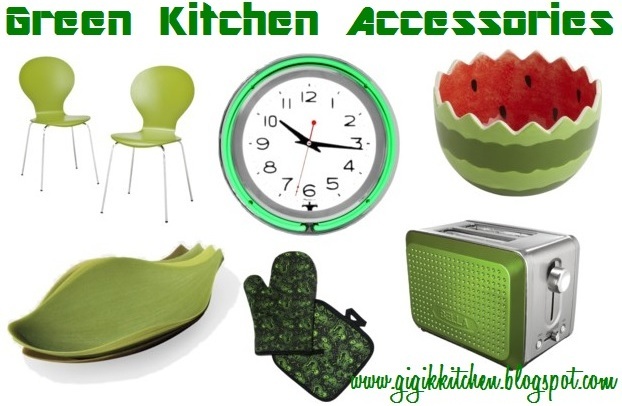 The green color in a kitchen setting might not be to everyones liking and It's also got that country vibe which isn't necessarily going to be to everyones taste either. Although I can't see myself in a kitchen like this I do find it quite striking and beautiful too! 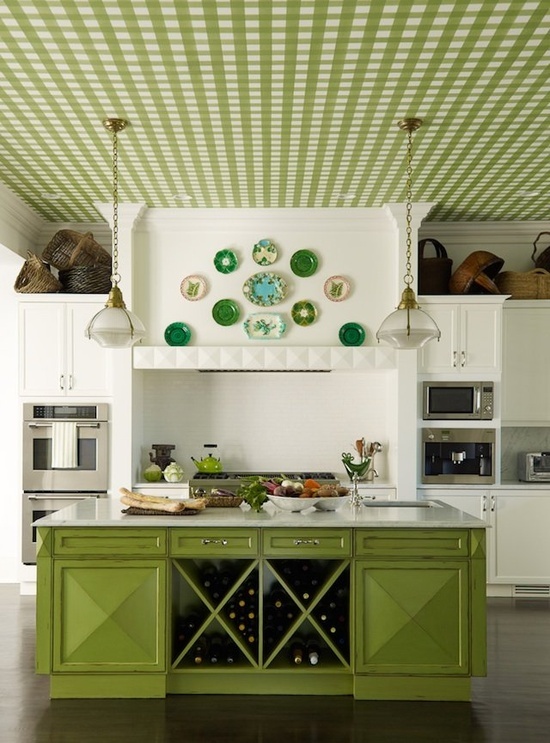 I think the green island adds character to what would otherwise be a simple white kitchen and of course that green gingnam ceiling is what I love the most as it gives this kitchen so much personality. Some of the details that appeal to me are: A) The built in appliances which give the room a modern feel B) The molding above the space where the stove is which seems quite unique in it's carvings. C) The space for wine at the front of the island is fantastic and saves space elsewhere. The details I'm not too crazy about are: A) the lighting which seems kind of rustic to me and even a little out of place with that modern background. B) The plates hanging above the stove are not my thing at all. I think it would do better with a piece of art or an appropriate painting.